The essence of a traditional Christmas is captured in the lyrics of Jingle Bells. However Charlotte Olympia intends to spruce up the festival’s fashion trend by launching an exclusive capsule collection. Christened, Jingle All the Way, the collection celebrates with X’mas themed clutches and footwear. “All I want…” is uttered to express our desire to own the best and most beautiful stuff that come our way. 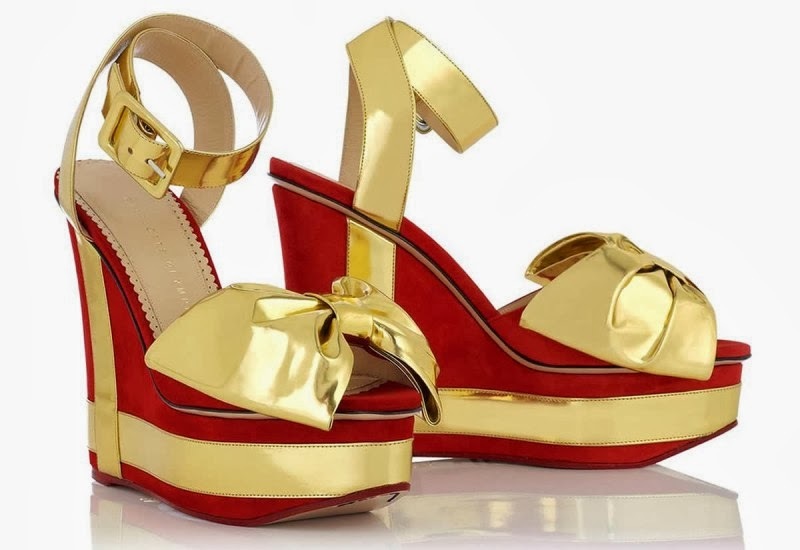 So here is the All I Want red and gold patent leather wedges from the Charlotte Olympia’s stable. Materialize your wish by stepping in to the glistening wedges shaped out of suede and calfskin. Made in Italy, it can be strapped on with a buckle ankle strap. Sporting a 4 inch heel along with 1 inch platform, the sole also puts on view the signature gold Charlotte Olympia spider web logo. All I Want wedges are up for $1,300. Match the above mentioned red wedges with Gift Box clutch bag. 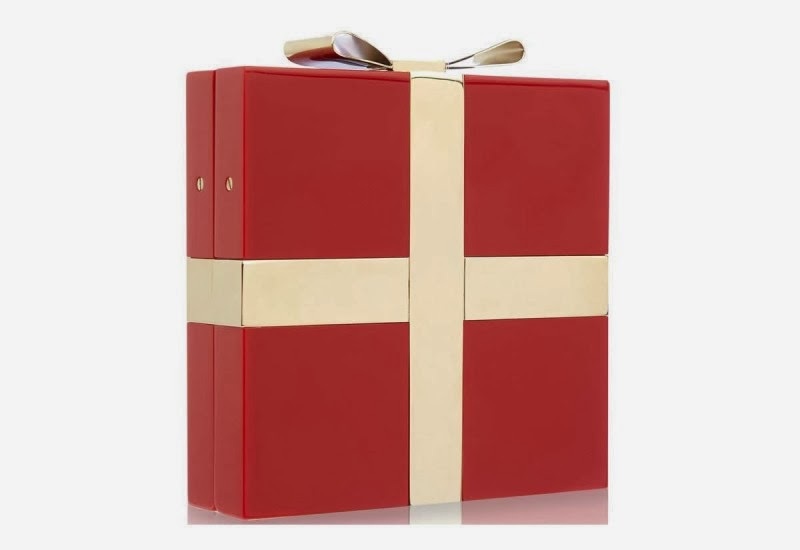 Up for $1,600, this blood red perpsex square clutch box is sealed with a shiny gold ribbon. The bow shaped clasp closes the clutch hidden magnetic closure. This hot gift shaped bag is also made in Italy and sized at 9 x 6 x 1 inch. It also sports the label’s sign on the hinge. 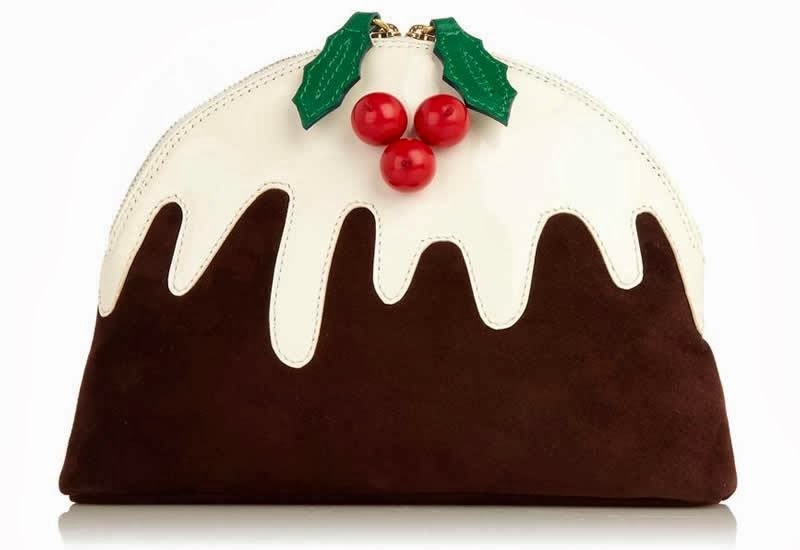 Indulge in the most lip-smacking of all accessories, the Christmas Pudding pouch. Made from rich brown suede, cream patent icing topped with green stefanil leaves and red berry beads, it is the ultimate Christmas treat for $800. Featuring gold plated Charlotte Olympia plaque inside, it is completely lined in blush silk. 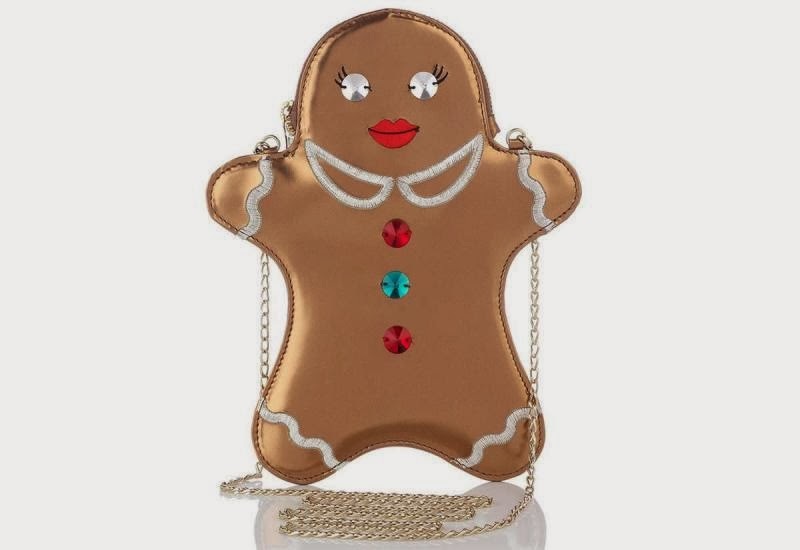 Ginger not only ups the spicy flavor of a dish, but Charlotte Olympia’s Ginger ups the playful element with the patent leather and embroidered gingerbread lady clutch. For $750, it dazzles with Swarovski details and comes with a detachable strap. Add jingle to every step you take all through the merry-making season with the Jingle Bell Dolly. A must-have to raise the glam quotient without losing the essence of the season, these red velvet pumps will make a melodious statement for $1,000. Sporting a 6 inch heel, it stands tall on a gilded calfskin 1 inch platform. If making noise is not your style then the jingling feature can be eliminated with the detachable ankle straps that hold the gold bells.